Pepper is a male timid harlequin guinea pig. He ran so quickly around his hutch we struggled to get a photo of him that wasn’t blurry!! Spice is a femle harlequin guinea pig. We think she may be pregnant so potentially will have babies to rehome soon. Spice can be reserved now but won’t be rehomed until either we know she isn’t pregnant or her babies have been weaned. Meet Hendrix, he is an adult black and white male rabbit who was brought into the RSPCA Derby and District branch as a stray. He is a lovely boy who would be fine to live with other rabbits. 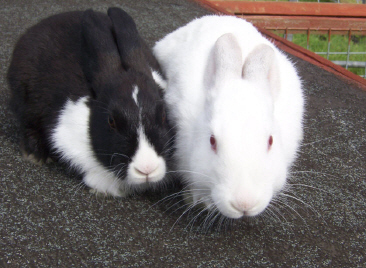 Parsley and Chive are a pair of 3 month old male rabbits, one is black and white, one is white. They are very friendly and in need of a loving new home. For further details, please contact Margaret Green Foundation Trust’s Lincoln Farm branch in Dorset on 01929 471340.